Ruby red in color. 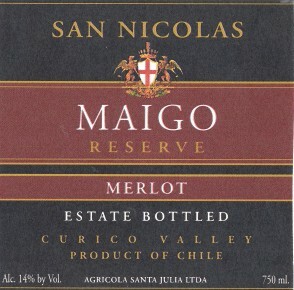 There are black fruit aromas and flavors, often cherry, on the nose and palate with hints of spices and green peppers. A smooth and harmonious wine with a velvet texture. Pairs well with pasta dishes and fresh cheeses. The Merlot grapes are hand-picked. Malolactic fermentation in stainless steel tanks at a controlled temperature. In small American oak barrels for months.